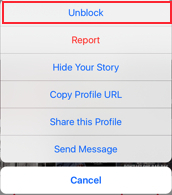 Are you looking for a way to stop people from following you without blocking them on Instagram? This is a very common question and there is very little answers out there on how you can do this. In this article though, I’ll be giving you the answer to how you can do this. As of today, the only way to get people to stop people from following you is by simply blocking them or asking them to unfollow you. A lot of people think it’s rude to block people just because they don’t want them to follow them and this is understandable. Blocking someone can often be seen as rude and is normally mostly one to bots, spammers, exes or stalkers and not just ordinary people. 1. Go to the profile of the user you don’t want to follow you anymore. 2. 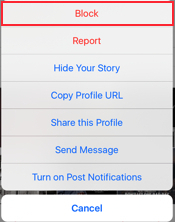 Tap the three dots located in the top right corner (as seen below). 3. Choose “Block”. Now, I know this article was about a way that you could get people to stop following you without blocking them and that’s exactly what it is. Just continue reading. 4. You will then get an option to “Block” or “Cancel”. Choose “Block”. 5.You will then get a confirmation message that the account has been blocked. 6. Now comes the fun part. Quickly tap the three dots on the top right corner quickly. 8. Just like when you blocked the user, you will be asked if you want to unblock the user or cancel. Tap Unblock. 10. Now, the user won’t be following your account anymore and at the same time probably didn’t even realize they were blocked for a few seconds. As of now, this is the only way to stop people from following you without blocking them and unfortunately, very few people know about it.